Inspiration finds me on my travels or is gleaned from the natural world. A trip to Italy gave birth to an entire book of patterns (Knitaly) while Morocco inspired the Berber Jacket design. I also enjoy leafing through magazines, primarily fashion-orientated glossies, indulging in colors and shapes. Sometimes designs just seem to manifest from nowhere but, of course, they usually an on-going composite of ideas and impressions. Mixing simple stitches with glorious yarns. Many of my designs fit all sizes, like wraps, but, since many of my fans are women of substance, I try to offer designs for all shapes. I love looking at other designers work but my approach is usually so different I couldn't begin to duplicate them, even if I tried (which I don't). I'm very non yarnogamous and can no longer stick with a single yarn for a whole project. I don't like the term. As an educator of many years, I know that many people have difficulty reading standard patterns for a number of reasons, most of which have nothing to do with intelligence or ability. People learn and process information differently.When my allergies act up, for instance, there's no way standard knit code makes sense to me. I prefer to offer lots of narrative and visuals along with the knit code to hopefully reach the widest number of people interest in trying my approach. I do it all myself, as test knitters don't fit with what I do. I encourage tangents and explorations so there is no one right way of doing things. No, I evolved from an administrative position to a creative awakening. Along the way, my skills played a role in how my business evolved and I'm sure it was intuitively strategic but nothing consciously planned. Yes, many for all kinds of things but, over all, supportive friends have helped me unfold. Huge! The Internet made my business. No, see response above. I'm an anomaly. My life and my work are now one. After many years jumping hoops and conforming to standards, I have reinvented myself and encourage others to do the same. Acknowledge the rules and then do what feels best is my mantra. I keep a balance between home and travel with both an external and internal life. This works best for me. It surprises me sometimes how competitive the knit design business really is. 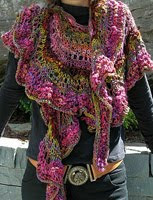 When I first began, I'd receive the occasional lecture on what did or did not make a 'proper' knitting designer. I recognized the tone as something I'd come across in my other careers where degrees and diplomas and hoops jumped determined career trajectory but I've always believed that many roads exist to an end. I've chosen to follow my own. Knitting design supports my lifestyle of travel and love of yarn and teaching about both but I can't say I make a living from it. The business has evolved over four years. Determine what works for you and don't accept the speed bumps thrown in your path by naysayers. These days, the Internet provides the tools for you to emerge on your own terms.